On Saturday we hosted our second installment of Barton Bloggers, an event for some of the amazing content creators in the North West. 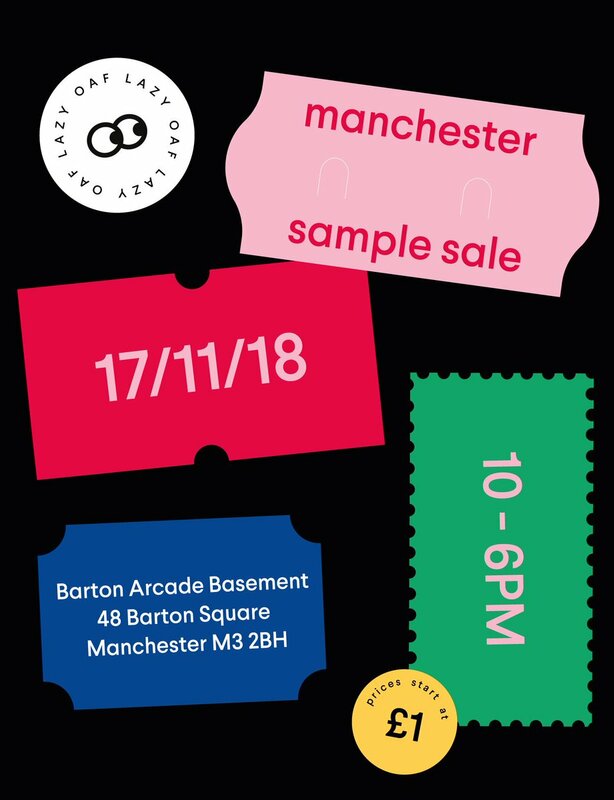 Barton Arcade has been a feature in Manchester city centre since 1871, and we feel it’s our duty to let people know about our beautiful Victorian arcade and all that goes on here. 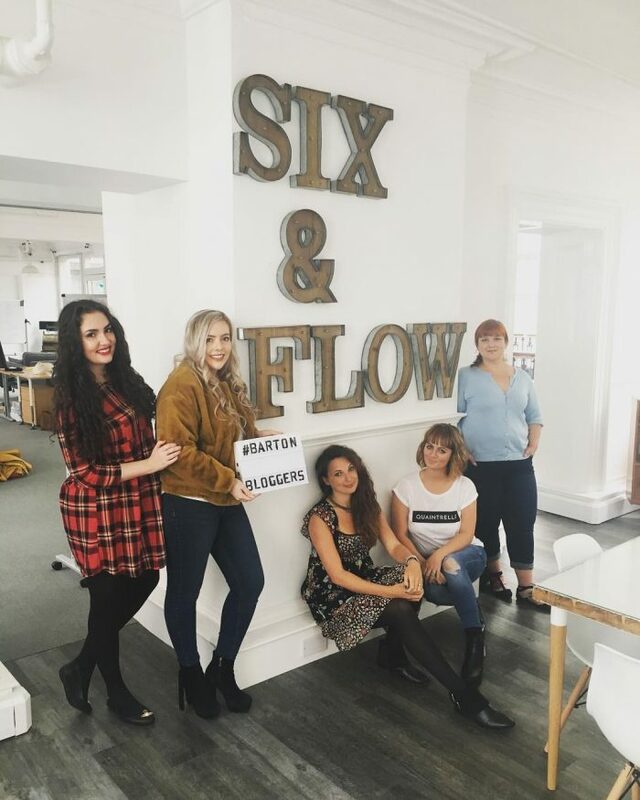 The event kicked off at the Six & Flow offices, where our bloggers met and discussed their plans for the day. We had the amazing Lily Kitten, Hair.Nails.etc, Spamella B, Mother Freckle, Gin Fuelled and Unlock Manchester in attendance. After briefing the bloggers about the day ahead, we set off to Too Funky Hair, attending a blow dry masterclass by the amazing Lee Marsh and getting some beautiful manicures by Sharna’s Beauty Bar. 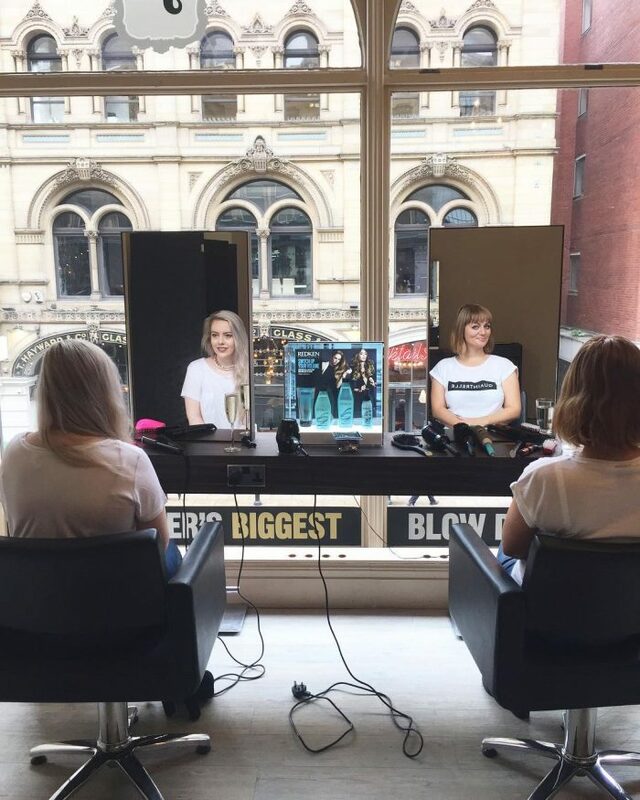 Lee explained how to do the perfect blow dry, styled some hair and talked our bloggers through how to achieve the look themselves, then it was time to practice. Sometimes when you go for a blow dry, the stylist doesn’t listen to what you want, luckily with Lee this isn’t the case at all. He talked with the bloggers about what they wanted and worked with their hair to give them the result that would most suit their lifestyle. For instance, you can probably guess from the name that Mother Freckle is a mum. She asked for a style that wouldn’t take too long to achieve, the results were amazing, quick, easy to replicate and exactly what she wanted. If you’ve ever had the pleasure of seeing Sharna in Too Funky Hair for your nails, eyebrows or lashes, you’ll know that she is the loveliest lady ever. Charlie from Gin Fuelled is attending a wedding on Thursday, so wanted something special for her nails, and Sharna well and truly delivered. 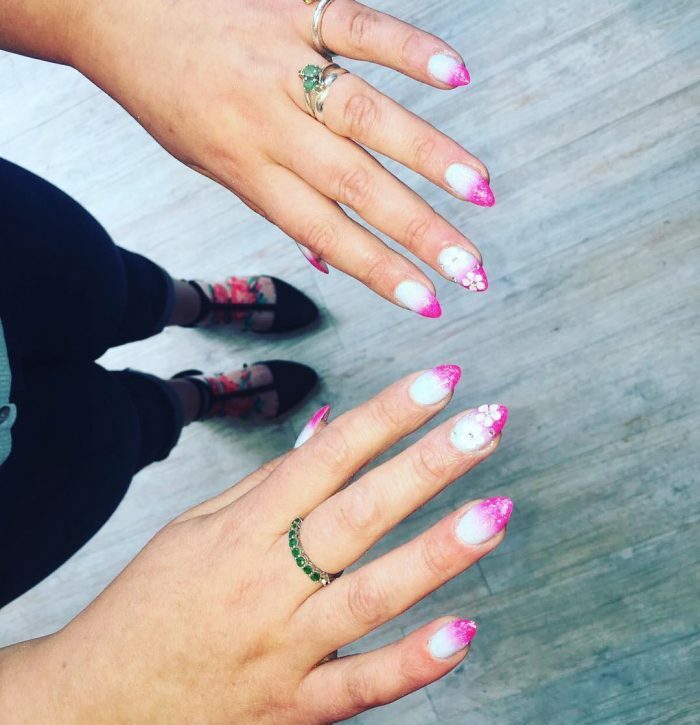 Charlie had nail extensions on, so Sharna worked with that, adding a cool ombre effect on the nail, as well as glitter and flowers to give a stunning, almost unicorn inspired look. As well as all manner of nail services, Sharna also does microblading and eyelash extensions at Too Funky Hair. She’s a real pro and is well worth getting booked in with. After being well and truly pampered at Too Funky Hair, we were a little peckish and took a trip to Spain for some tapas. Rather than heading abroad, we went for the next best thing, the award-winning and family owned Lunya. Lunya occupies two floors of Barton Arcade, and even comes complete with a gorgeous deli for all of your Catalonian takeaway needs. Not only is the food from Lunya incredible, but the staff are unbelievably helpful and welcoming. Unlike other tapas places which may still leave you hungry, Lunya delivers on quality and quantity. 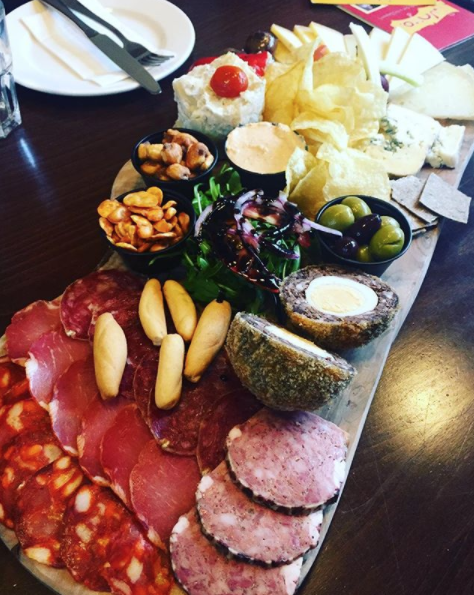 When we arrived at Lunya, the staff brought over a delicious sharing platter, pleasing cheese and meat lovers alike. We tucked into the feast and pondered over what to order from Lunya’s extensive menu. 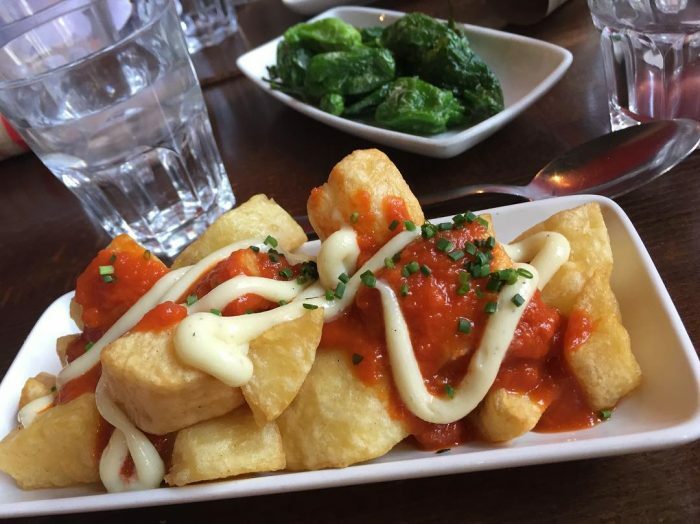 In our opinion, you can’t really go for tapas and not order patatas bravas. They’re a staple and we love them, plus Lunya gives a very generous portion, so it’d be rude not to order. Another of the dishes that deserves a special mention is the Catalan hot pot, Lunya’s rich and tasty signature dish made with chorizo and morcilla, which blends Catalunya with the North West of England. 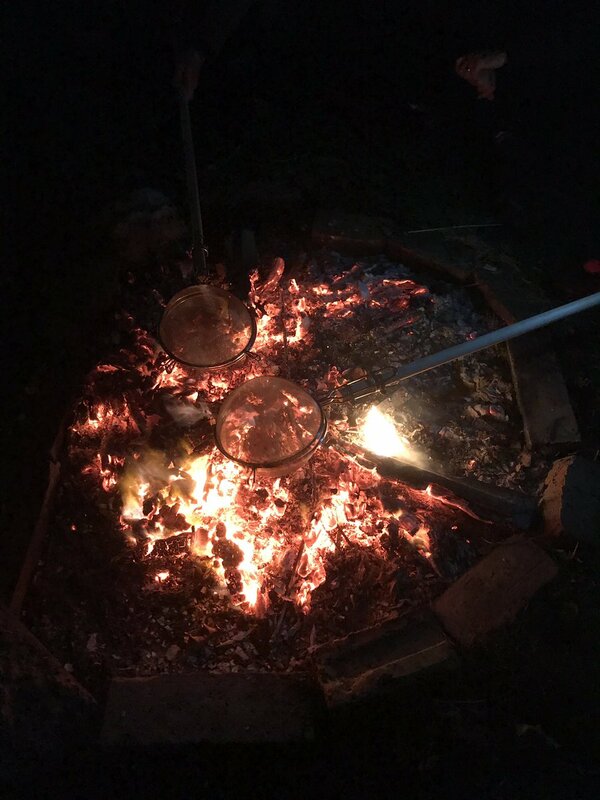 We’ll definitely be ordering that again, especially now that winter is coming. If we went into every dish on Lunya’s menu, we’d be here all day, but if you do want to have a look at the menu, you can find it here. If you’re looking for affordable and incredibly delicious tapas, Lunya is the place for you. After filling up on tapas and wine, we headed off around the arcade to take photos. 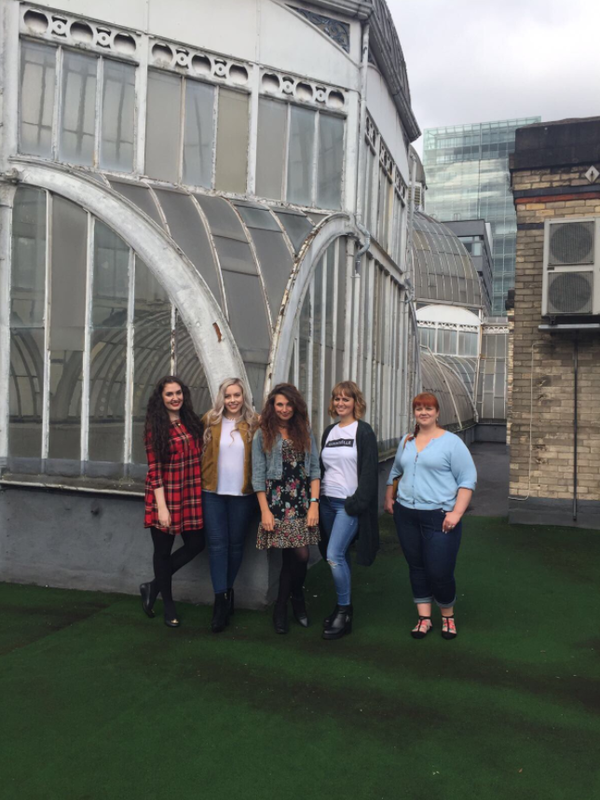 Barton Arcade’s roof terrace is one of the best-kept secrets in Manchester, so we treated our bloggers with a trip to the roof. The roof space is huge, and on a good day it’s the perfect spot to catch a little of that rare sun Manchester occasionally graces us with. Stunning views across Manchester are coupled with the Victorian dome of Barton Arcade, and there’s even a luxury apartment up there, currently available to rent. Our last stop of the day was at Be At One, a cool underground bar. Tucked away on a side street, Be At One is a place that instantly makes you happy as soon as you step through the door. The playlist always gets you in the mood for a night out, or a nice day drink, whichever takes your fancy. Be At One’s cocktail menu is certainly designed for people who can’t make decisions, featuring a wheel which matches up flavours (smoky, sweet, bitter etc.) with alcohol and other ingredients to suggest your perfect cocktail choice. 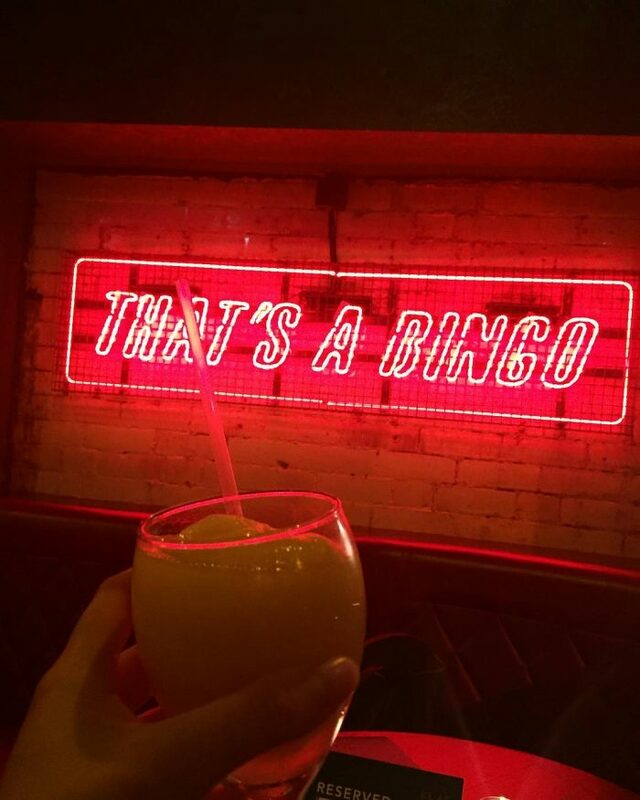 If you like cocktails and vibrant nightlife, add a trip to Be At One to your Manchester bucket list. If you like the sound of our Barton Blogger event and want to get involved, get in touch and we can make it happen.